Figure skating is no doubt a beautiful sport to watch. Figure skaters move with elegance performing jumps and spins, making it look effortless. These moves are far from easy though, as those learning to figure skate for the first time will come to find out. Figure skating techniques take practice and dedication in order to reach a high level of skating. Executing the perfect jump not only requires the right kind of boot and blades, but it takes into account the amount of speed, momentum, friction, and timing. Understanding some of the physics of figure skating can give you an idea of just how hard it is to perform and master some of these skills. More than likely, you are someone who is not a physicist, therefore, some of these terms may be confusing to you. Here are a few of the terms and definitions that are often used to describe a figure skaters movements. Friction: Friction is a force that resists when two forces slide against one another. For example, when a skater’s blade glides on the ice it creates friction. Moment of Inertia: This is a measure of how mass is distributed relative to the center of gravity. This is important for skaters when keeping their balance. Momentum: Momentum is how much force it would take to stop a moving object. The heavier something is, like a figure skater’s body, and the faster it is going, the harder it will be to stop. Angular momentum applies to a body rotating around a fixed object. Angular moment is required when a skater is performing spins. Velocity: Velocity is the speed of something in a given direction. Vertical velocity is what helps skaters get as high as they can in a jump. One of the best ways to view physics in action is through figure skating. There are many components to figure skating that require physics to perform such as jumps, spins, and landing. Let’s take a look at how these movements utilize physics. Just watch the movie Ice Princess for reference; as many young skaters did. A skater’s vertical velocity is what determines how high of a jump they can achieve. Typically, a skater doesn’t get very high in the air. The average height for a female skater is around 16 inches and the average height for a male skater is around 20. The skater extends their leg downward to push down on the ice, while the ice provides an upward force, creating vertical velocity. The force achieved depends on the size and weight of a skater, as well. Jumps are what will help a skater create the angular momentum they need to perform difficult spins. Adding a spin to a jump makes it more difficult and fun to watch, but how is that spin achieved so seemingly effortless? A spin within a jump results from how much angular momentum you have, how small you can make your moment of inertia, and how long you are in the air. A skater wants to make themselves as small as possible in order to decrease the moment of inertia. The moment of inertia and angular momentum go hand-in-hand when completing a spin. The moment of inertia in figure skating is the measurement of the distance the skater’s mass extends outward from the axis on which he or she is spinning. You not only want a smaller moment of inertia but if your arms are stretched out then it will slow down your angular momentum, as well. Even the slightest variation in where a skater’s arms are can have an impact on how fast their spin is and how long they are in the air. A skater relies on friction to stop and go on the ice. The blades on a skater’s boot are important for harnessing friction. Blades are comprised of an inner and outer blade and are cut at an angle to give a skater extra grip on the ice, providing them with a stronger force when they move. Additionally, toe picks, blades also have toe picks. A skater uses these to dig into the ice when they want to come to a stop or launch into a jump. It’s no doubt physics plays a huge role in how the movements of figure skating are performed and achieved, but having the right equipment can also play a factor. 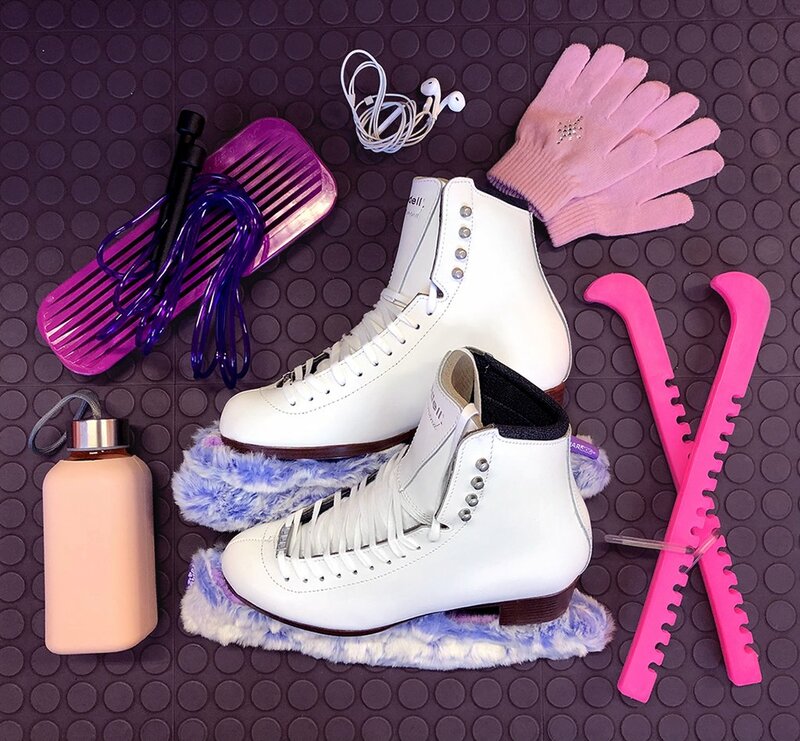 By customizing your figure skating boots with Riedell, you can not only achieve optimal comfort and support for your unique feet, but you can determine which type of blades will benefit you the most. Contact us today to get started on creating your perfect skates.